Peyton completed her PhD in biomedical informatics and is now working to apply machine learning techniques to experimental design. Scientists can now detect signs of cancer in blood samples through looking for pieces of mutated tumor DNA. Peyton is working to design primers that can detect tens of thousands of possible mutations quickly and cheaply in a blood sample. Frequently such primers are tested in a trial and error approach, which can be time-consuming, wasteful, and often ineffective. Peyton’s work is to develop machine learning methods that optimize the design of primers and synthetic DNA sequences as efficiently as possible. These algorithms can then predict which experiments would be most effective for a scientist to perform next. 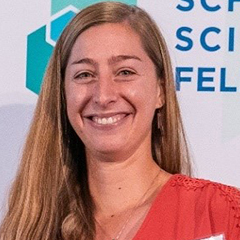 Peyton’s research as a Schmidt Science Fellow, working with Prof Emma Brunskill at Stanford, could make an important impact on the study and treatment of cancer.